Burlingame is situated on land previously owned by San Francisco-based merchant William Davis Merry Howard. Howard planted many eucalyptus trees on his property and retired to live on the land. Howard died in 1856 and the land was sold to William C. Ralston, a prominent banker. In 1868, Ralston named the land after his friend, Anson Burlingame, the United States Ambassador to China. After the 1906 San Francisco earthquake, hundreds of lots in Burlingame were sold to people looking to establish new homes, and the town of Burlingame was incorporated in 1908. In 1910, the neighboring town of Easton was annexed and this area is now known as the Easton Addition neighborhood of Burlingame. Burlingame is known as the City of Trees due to its over 18,000 public trees within the city. In 1908, the Burlingame board of trustees passed an ordinance "prohibiting cutting, injuring, or destroying trees". The city also has many parks and eucalyptus groves. In the 1920s Burlingame became a popular location for automobile retailers which became known as "Auto Row". In the 1960s, various airline support service businesses opened in Burlingame due to its proximity to San Francisco International Airport. As of 2018, LSG/Sky Chefs, Inc., Virgin America, and China Airlines are all located in Burlingame. Historically, Burlingame has also been home to many candy and chocolate companies, including the Burlingame Museum of Pez Memorabilia, Guittard Chocolate, the See's Candies lollipop factory, and family owned candy stores Powell's, Preston's, Aida Opera Candies, and Nuts for Candy. 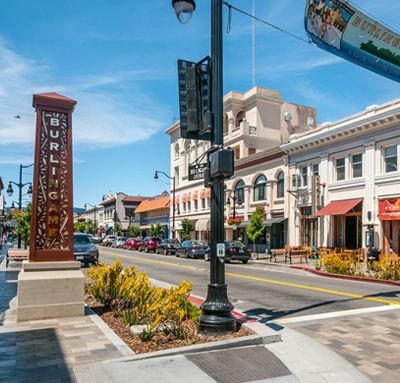 Since 2010, Burlingame's economy has diversified substantially and it has become an attractive location for biotechnology companies owing to its proximity to South San Francisco, the birthplace of the biotechnology industry. Biotechnology companies with offices in Burlingame include: Annai Systems, Breathometer, Cala Health, Cleave Biosciences, Collaborative Drug Discovery, Confidence Clinical Research, Corvus Pharmaceuticals, Igenica Biotherapeutics, Kindred Biosciences, Omnitura, Phoenix Pharmaceuticals, Pulse Biosciences, and Vector Labs. Additionally, multiple high technology firms have established offices in Burlingame due to its location between the booming technology centers of Silicon Valley to the south and San Francisco to the north. Tech companies with Burlingame offices include: Zecco.com, Natsume, Color Genomics, CarWoo, Jobvite, DataStax, Sprint's M2M Collaboration Center, YouWeb, OpenFeint, CrowdStar, BitGravity, Veebeam, and TellApart.